Although short, just 1.1 miles, the Ridge View Trail in Saguaro National Park is a rewarding and scenic route, climbing gently up a bushy valley then slightly more steeply over a rocky slope to a fine viewpoint atop a ridge, facing the sweeping south face of Tanque Verde Ridge. The path is one of two that start from the Loma Alta trailhead along the south edge of the eastern (Rincon Mountains) district of the park, a much quieter area than the main entrance along the Old Spanish Trail. The best time for the hike is mid to late spring, when the wildflower season peaks, though the short distance makes this suitable for any time of the year. 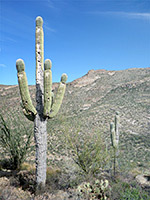 Along the way are many aged, multi-branched saguaro, and examples of all the other common cactus species in the park. Map of the east section of Saguaro National Park. View from the end of the trail. Full screen version (22 mb). The trailhead, which is not obviously signposted, is reached along Camino Loma Alta, a straight residential street leaving the Old Spanish Trail 7 miles southeast of the main national park entrance. The road passes scattered houses, most with fine cactus collections in the gardens, then enters the park and becomes unpaved and somewhat bumpy for the final half mile, ending at a small parking area. At busy times vehicles have to be left further back, on verges. The land to the west is private, and another track from this direction, indicated on some maps, is closed by a gate. The trail heads eastwards, soon reaching a junction where the main path continues straight on towards Hope Camp (2.8 miles), site of early 20th-century cattle operations, while the Ridge View route bears left, initially crossing a patch of exposed, whitish earth then entering a shallow valley, heading towards a rounded hill in the distance. The path, initially straight, later veers to the right, through a briefly narrower section of the drainage and rises to open slopes which allow the first good views eastwards towards the Rincon Mountains. The latter section ascends a broad hillside, sprinkled with jagged rocks mixed with many springtime wildflowers. 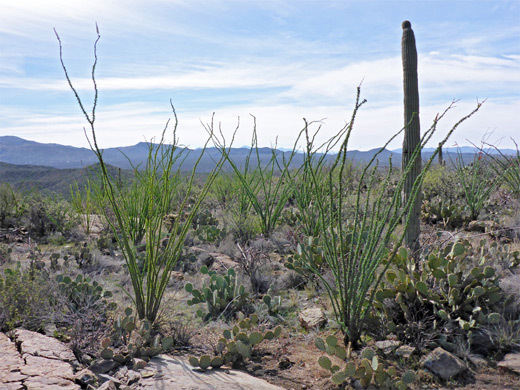 The trail ends, after a twistier section, on a rounded rock ridge from where the land slopes away all sides, most steeply to the north, down to the valley separating the viewpoint from the foothills of Tanque Verde Ridge, covered with thousands of saguaros.